Driven by an entirely deeper dynamic than most pop artists, David Bowie inhabited a very special world of extraordinary sounds and endless vision. Unwilling to stay on the treadmill of rock legend and avoiding the descent into ever demeaning and decreasing circles of cliché, Bowie wrote and performed what he wanted, when he wanted. His absence from the endless list of “important events” has just fuelled interest. Constant speculation about what the guy was up to has even led some to wonder if this is his greatest reinvention ever. David Jones! This is a supreme concert with masterpiece delivery, an obvious exercise of pure joy. I have a personal preference for live performance and recordings and I enjoy new arrangements and the live charge between performers and audience. This one has it all and it's going to be played a lot. Bowie always had a principal of leaving stage front to allow his musicians their time in the sun. I like the camaraderie, and in this case, the group hug with Gail and Ster at the end. Priceless. The sleeve notes are some of the best I've ever read. This is one innovative packaging that will never lose itself on the shelf, just like Bowie. No matter what stage of his career, David Bowie is always a sight and sound to behold. The song choices are varied and played with precision by, as always, an incredible group of musicians. Old favorites are sprinkled among some of the newer tunes of the time. The intro to "Let's Dance" is one of my favorite re-workings of his songs and I wish he had done the entire tune with the new arrangement. The DVD is an extra treat showcasing David's progression from timid at the start to growling "I'm Afraid of Americans" at the end. Nice packaging and an insert booklet featuring David's thoughts leading up the show. I hope that more gems like this make their way out of the vault! What a treat! Loved the pink package nodding to Bowie the fashionista and the little book with notes from DB. Incredible filming of the band and stage. The concert footage really gives me a sense that I am there. As the show progresses, so fun to see Bowie's fun and flirty personality emerge. The audio recording is fantastic and does immense justice to Bowie's vocals. I am so impressed with his 55 year old voice, especially when he sings the earlier hits. This is an amazing piece of history for Bowie-philes! It's like we get to see him one last time. The Glastonbury cd and dvd is just amazing to watch and listen to. David never fails to bring the best of everything to his music and his concerts were always tops! This is a must own item! Sit back and enjoy the show! Where to start? The boxset is well presented: simple square box with every item having its own protecting jacket. 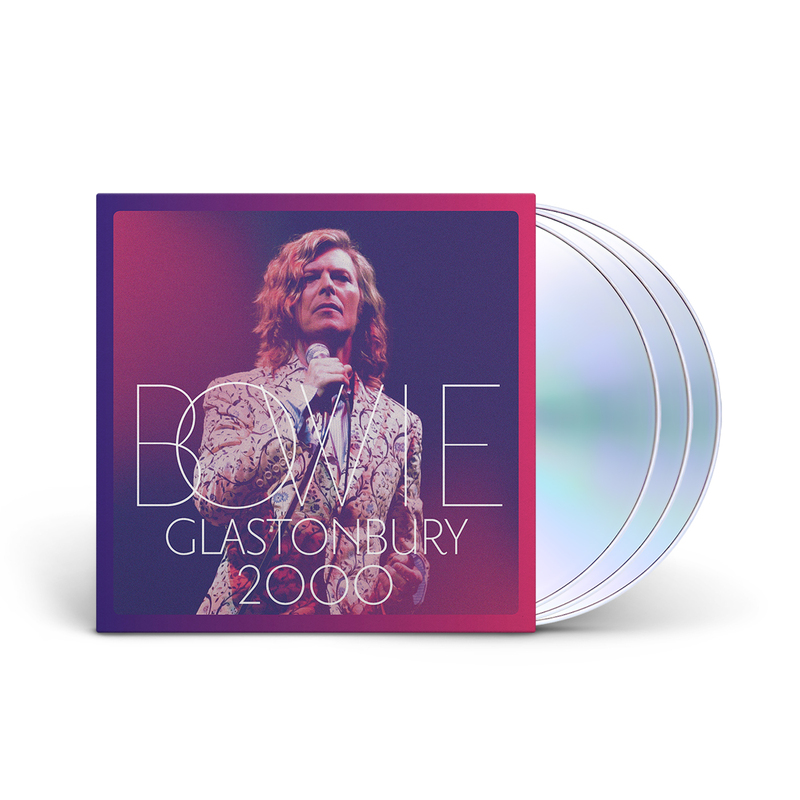 The overall sound is decent for a live recording, the song selection is a fair reflection of Bowie's carreer and thanks to the well written libretto, we know why those songs were preferred by Bowie. Speaking of the libretto ( booklet), I had a very nice surprise to read a few pages of David's personnal journal where he put many thoughts he had a few days before the concert and shares his state of mind about it in typical Bowie humour. As for the video, well, it would have been awesome to have it in a blue-ray format but hey, dvd is better than nothing,lol. I am very glad the kept filming the whole show. It is a vivid and rare live video recording Bowie did. And what a thrill to watch and listen to live rareties as Wild is the wind - Absolute beginners-Golden years-the man who sold the world and many of his hits. Good camera shots, etc. In short, a must for true Bowie fans. And it was great to see half of the band last February as Mike Garson brought the gang in Montreal to play an amazing tribute to Bowie's repertoire.